Can Dogs Use Human Emotional Expressions to Identify Which Box Contains Food? Dogs are very aware of human emotional states. An earlier blog post looked at how dogs respond to a crying stranger. This week’s post is about whether or not dogs can use human emotional cues to tell them which of two boxes contains a tasty treat. The research was conducted by David Buttelmann and Michael Tomasello in Germany. They compared two sets of human emotional expressions: Happy vs Neutral; and Happy vs Disgust. They tested 58 domestic dogs (Siberian Huskies, Labrador Retrievers, Golden Retrievers, Border Collies and German Shepherds). The Siberian Huskies were tested at the open air enclosure where they lived, and the other dogs were all tested in a room, mostly with the owner present. The experimental set-up involved two cardboard boxes, each containing an item that acted as a clue to the experimenter as to which emotion they should display: sausage for the happy condition, wood shavings for the neutral condition, and garlic for disgust. The dogs were given a warm-up in which they were shown a pair of boxes and learned that they would receive any food that was in the box they chose. Then a screen was put up, and the experimenter pretended to be busy while an assistant placed items in the boxes. When the screen was removed, the experimenter came to the table and called the dog over to watch. The experimenter lifted the lid of each box in turn and acted out the appropriate emotion. There were two boxes in each condition, so they acted either Happy and Neutral, or Happy and Disgust, depending on the condition. For the Happy and Disgust emotions, they also said the German word for nightingale in an appropriate tone of voice. This word had no meaning for the experiment, so only the tone of voice was relevant to the dogs. The dogs were given a chance to choose a box, and then shown the contents. If it was sausage, they were allowed to eat it. Then the whole procedure was repeated. If the dogs showed a bias to a particular side (e.g. they always chose the box on the left), there was another warm-up session in which they were shown that either box might contain food. The results showed that in the Happy-Neutral condition, the dogs chose the Happy box 52.1% of the time. In the Happy-Disgust condition, they chose the Happy box 54.9% of the time. In each case, this was significantly better than chance, suggesting that they were using the human expressions as a clue. Some individual dogs performed exactly at chance levels. This was because they chose a side and stuck to it throughout the experiment, despite the warm-up session designed to show that the box on either side could contain food. For some reason the Siberian Huskies performed better than the other dogs. Since the huskies were tested outside, they may have been able to use smell to distinguish between the boxes, especially since they were tested on a windy day. So a control condition was done with just Siberian Huskies, outside. This had the same procedure, i.e. one box contained sausage and the other contained either wood shavings or garlic, but the experimenter always had a neutral expression. In this case, where the dogs had no emotional expression to help them, they did not perform significantly better than chance. However, they also did not perform significantly better than in the earlier experiment. These results suggest that dogs can distinguish human emotions, and use them to help identify which of two boxes contains food. However, the reason why the Siberian Huskies performed better than the other dogs is unexplained, which suggests that further research is needed before we can draw a definite conclusion. One thing missing from this research report is a consideration of what a social scientist would call the lived experience of the dog. What I mean is that a dog’s experience of observing human emotions may not show them to be a reliable indicator of whether or not something is tasty. Some dogs have a habit of finding things to eat that cause a look of disgust on their owner’s face, even though the dog likes it very much. This is a fascinating piece of research despite the fact there are a few things to tease out. I look forward to seeing the follow-up studies. What disgusting things does your dog like to eat? As always, feel free to leave any other comments you have about this research. The study appears quite flawed. Why? Varied breeds with extremely different cognitive abilities. Border Collies being considered one of the more intelligent of breeds with Huskies being on the opposite end of the scale. You haven't stated if any of these dogs have had close association with humans or if they have lived in a situation which primarily excluded any interaction with humans. The conclusion is happenstance not science. Thanks for your comment. Siberian huskies are actually very intelligent dogs, although they are also independent. What's common about all of the breeds in this study is that they are working dog breeds. It's good to use a range of breeds if you want to know about dogs in general, rather than just one particular breed. They were all domestic dogs, and as I said for most of them the owners were present for the study. The siberian huskies lived outside, at a facility for sled dogs; they had different owners but all were used for racing. So all of the dogs were used to interactions with humans. I agree with you that the study has flaws. However, a fair consideration of the advantages and disadvantages of a particular approach is one of the ways science advances. That's why I'll be interested to see what they do next. Thanks again for your comment. It's good to take a thoughtful approach to these things. What about smell? Couldn't the dog smell what was in each box? That was my first thought too, and as I see it the biggest flaw of the experiment design. Given dog's highly sophisticated ability for detecting even extremely subtle scents, I don't buy that the dog could not smell the sausage or the garlic under the lab conditions. That sounds like a naive assumption. It's a good question, especially since sausage and garlic have a strong smell. (Incidentally these items were chosen after they pre-tested a group of dogs to ensure they had something dogs would like, and something dogs would prefer to avoid). 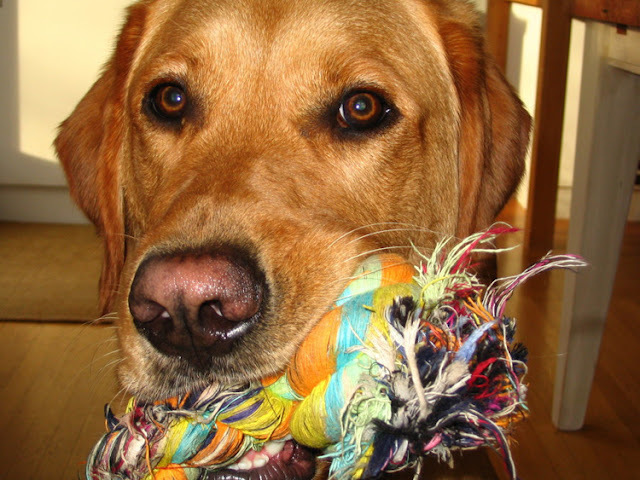 The authors are confident dogs could not use smell in the tests that took place in the lab. Once the boxes were set up, they had lids on except while the experimenter was looking to see what was inside. The experimenter lifted the lid to peek in on the side furthest away from the dog, and didn't take the lid off completely. The dogs didn't get to smell the boxes; whichever one they put their nose to first was opened. So the dogs didn't get to go from one box to another trying to smell the contents. Because the siberian huskies were tested outside on a day that was "sometimes windy", it could have been possible they used smell, and that's why they did the control. In the control, the boxes still contained either sausage/garlic, or sausage/wood shavings, but the experimenter kept a neutral expression. If they had used smell, you would expect them to do just as well as they had done originally, and they didn't. They don't say what the wind conditions were like on the day of the control study compared to the day of the original experiment. They haven't ruled out that something about the experimental procedure outside was a clue to the siberian huskies. I would like to see them do the experiment again, using something that isn't smelly in the boxes. Obviously it would still have to be tied to a reward, like sausage, or the dogs wouldn't have a reason to participate. But perhaps they could use two different non-smelly items. They would have to associate one of those non-smelly items with sausage beforehand, and then run the study again. I wonder if that would solve the question of smell conclusively.